Haiwan tea factory was established in 1999. 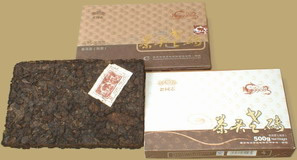 This 9908 Cha Tou brick is a new recipe prepared by Mr. Zou Bingliang, it is the first edition of Haiwan "99" series Pu-erh. The factory used their old "Cha Tou" which accumulated for years and compressed them into this excellent brick. The tea gives an ever-smoothening taste and never bitter, with a fair amount of sweetness. This Pu-erh can be infused many times. After 20 infusions the tea keep giving a sweet mellow flavour but requires the hottest water possible.